When writing your CV, it’s easy to make simple mistakes that can harm your chances of securing that dream job. Here are 5 things worth remembering before you hit ‘send’ on your application! 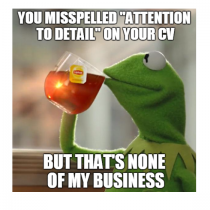 You’d think it would be obvious that spelling errors, poor grammar and nonsensical statements can damage your chances when applying for roles, but you would be surprised by the number of applications and CV’s sent out that are riddled with them! Make sure to read through what you’ve written at least once. Don’t allow your eagerness to ruin your chances. Take a step back. The role won’t be filled in the time it takes you to proofread. Go away for ten minutes, make a cup of tea and read through again or ask a friend to go over it for you. Fresh eyes are often all it takes to spot a silly mistake. Employers and recruiters don’t want to sift through twenty pages…aint nobody got time for that! Keep the detail relevant and cut down where needed on early, unrelated roles as your experience grows. badger_milk_makes_u_strong or badboy1991 may have been funny at school but a simple name/number combination is far more appropriate for potential employers. NOTE: While we’re on the subject of ‘CV comedy’; Don’t. Just don’t. You might think it’s showcasing your personality, but ‘funny’ rarely translates well on paper and will probably do more harm than good. You don’t need to start from scratch every time, but a tailored cover letter and CV will not only make your application stand out, but it will show you are genuinely interested in the company and/or role. If you know you can’t answer a call during work or for any other reason, make sure to reference this in your cover letter and offer times when you can speak. It isn’t presumptuous to assume an employer or recruiter may want to talk to you about your application but you could miss out to someone else if they are left to think you just don’t answer your phone/return their calls. Personal Attributes: Cat-like reflexes. Now you see me, meow you don’t. I am calm under pressure and keep my outbursts to a minimum. 2001: Summer voluntary work for taking care of the elderly and vegetable people. Please don’t misconstrue my 14 jobs as ‘job hopping’, I have never quit a job. Career break: 1999 to renovate my horse. I speak fluent English and Spinach.